The City of Ashland places priority on improving water quality and efficient water management. As part of the City’s Comprehensive Water Master Plan, the City plans pipe the front section of the Ashland Canal (approximately 10,000 lineal feet) from Starlite Place to Terrace Street. The preliminary engineering phase (survey and field work) will begin February 2018 and is expected to take eleven months. Construction is not anticipated until late fall 2019 or early winter 2020, when irrigation water is not needed. The goal of the piping project is to replace the open-channel irrigation canal with below-ground pipe(s) to improve the water quality in Ashland Creek and to assist the City’s goal for overall water efficiency. In years when water supplies are limited, the Ashland Canal is used as a supplemental water source. The water is treated to drinking water standards at the City’s Water Treatment Plant (WTP). Raw water in an open canal is vulnerable to contamination from a variety of sources. These contaminants reduce the water quality of Ashland Creek. Ashland Creek routinely exceeds the State's maximums for E. coli bacteria in the summer months. Additionally, open canals are susceptible to water losses through seepage and evaporation. Water losses in the Ashland Canal are between 23% - 30%. 1) Irrigation customers will continue to receive irrigation water during the watering season. If the project is approved by the Ashland City Council, construction will take place during the off season, late fall 2019 or early winter 2020. 2) Trail access will not be interrupted until construction begins. At that time, trail access will be limited in certain areas. We will update the public on where those closures will be when we move forward with construction planning. Note: The Ashland Canal Advisory Group (ACAG) was formed with representatives from City of Ashland Commissions, local experts on water resources, wildlife, ecology, fire as well as homeowners who live along the canal. City Staff will be presenting more on the Ashland Canal Piping Project to the City Council during a study session on Monday April 1st. Please click on the links below to view the upcoming study session materials and presentation. 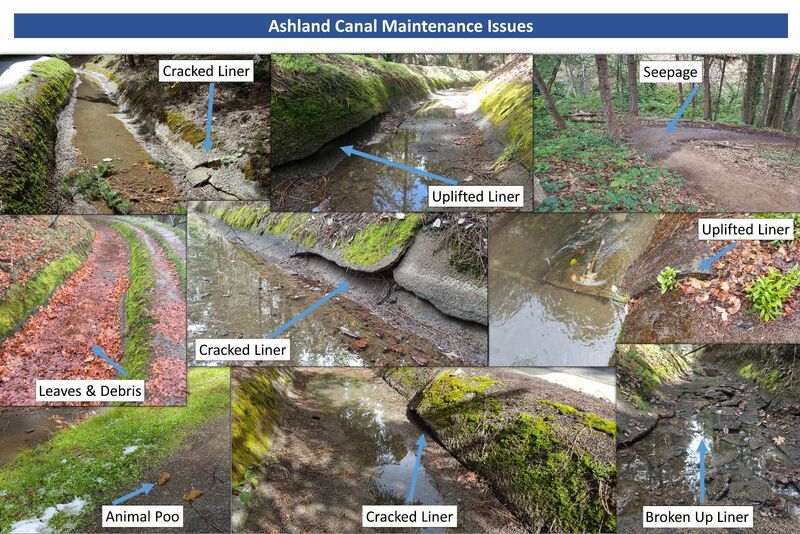 City Staff presented the Ashland Canal Piping Project to City Council on February 4th in a Study Session format. Council requested that a second study session be scheduled to continue reviewing the information. We will notify the public once a date has been chosen for the second study session. Please click on the link below to view the presentation. 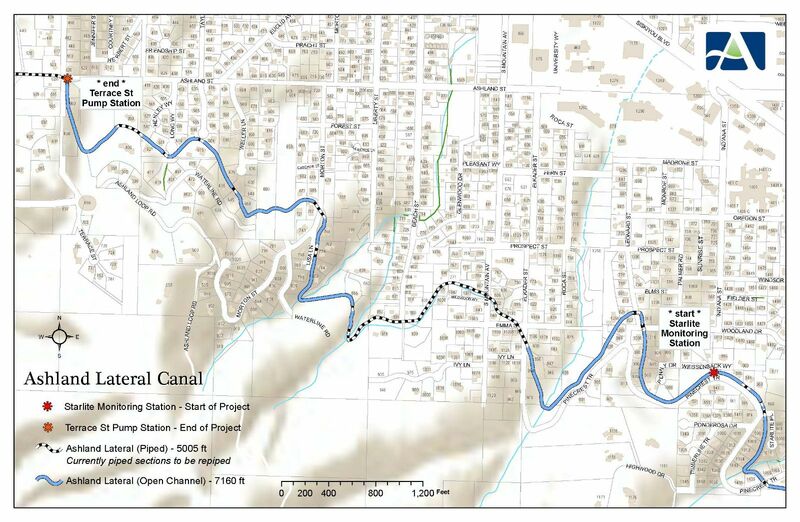 A community meeting and listening session was held on Thursday January 31, 2019 to discuss the proposed Ashland Canal piping project. Approximately 115 citizens and neighbors attended the meeting to hear a presentation from city staff detailing the findings from field research over the past year. Attendees were given the opportunity to voice their concerns and ask questions during the second half of the meeting. Below are the questions we received during the listening session. We will continue to work to provide answers to these questions. Additionally, a summary of the comments and preferred alternatives that were collected from the comment form that was handed out during the listening session can also be found below. Adkins Engineering has completed the final engineering report, geo-technical report, and project plans/drawings. The final ecological report and appendices from Siskiyou Bio Survey are also complete. Please click on the links below to view the full documents. Adkins Engineering has completed phase 1A and has updated the Engineering Executive Summary. Please click on the link below to read the final summary. This includes the seepage study results, drainage analysis, and four piping project options. Additionally, City Staff presented an overview of the piping project including feedback from local experts on impacts to wildlife, trees and fire suppression to the Ashland Canal Advisory Group on December 20, 2018. Click on the link below to view the presentation. The City has received the preliminary engineering report from Adkins Engineering as well as the Ecological Report from Siskiyou Bio Survey. Please click on the links below do read the executive summaries. We are currently in the preliminary engineering phase of the project. We anticipate our engineering Consultant’s (Adkins Consulting Engineering) to have this phase complete by the end of August. We are also trying to get a better understanding of how this project will impact the natural resources along the canal corridor. The City is working with Siskiyou BioSurvey LLC to complete a natural resources study and recommendations. We expect to have draft reports for these efforts also available to the ACAG by the end of August. Once the preliminary engineering phase is complete and the products are final the Public Works Department will begin contract negotiations with our Engineering Consultants to complete phase 1B and/or phase II. This new contract will be brought before City Council for award. If awarded, this phase is likely to include: permitting, easement modifications, construction work agreements and finalizing the plans and specifications (no construction in this phase). This work is likely to be complete by the summer/fall of 2019. Adkins Consulting Engineers have completed the surveying process along the two mile stretch of the Ashland Canal. They will now use the data collected to draft preliminary engineering plans. We expect to have approximately 30% plans completed by the beginning of July. We have also contracted with Siskiyou Bio Survey to complete an in depth analysis of the vegetation and trees along the canal. This evaluation will allow us to better understand how piping the canal may impact the local ecosystem. The report will also provide us with recommendations on best management practices to minimize these impacts. The survey crew from Adkins Consulting Engineers is hard at work surveying the project area. Adjacent neighbors can expect to see workers along the canal for the next several weeks. This will not interrupt irrigation services during the 2018 watering season. Phase 1A: Preliminary engineering phase (survey and field work). This phase is currently underway. Phase 1B: Obtaining permits, easements and construction work agreements December 2018 – June 2019. Phase 2: Final engineering, June 2019 – December 2019. Phase 3: Construction of piping project, 2020 - Irrigation services will not be interrupted. Construction will take place in the late fall 2019 or winter 2020 when the canal water is not needed for irrigation.